In a wireless environment, multimedia transmission is often affected by the error rate; delaying; terminal’s power or bandwidth; and so forth, which brings difficulties to multimedia content protection. 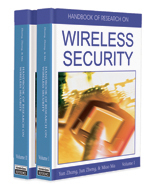 In the past decade, wireless multimedia protection technologies have been attracting more and more researchers. Among them, wireless multimedia encryption and watermarking are two typical topics. Wireless multimedia encryption protects multimedia content’s confidentiality in wireless networks, which emphasizes on improving the encryption efficiency and channel friendliness. Some means have been proposed, such as the format-independent encryption algorithms that are time efficient compared with traditional ciphers; the partial encryption algorithms that reduce the encrypted data volumes by leaving some information unchanged; the hardware-implemented algorithms that are more efficient than software based ones; the scalable encryption algorithms that are compliant with bandwidth changes; and the robust encryption algorithms that are compliant with error channels. Compared with wireless multimedia encryption, wireless multimedia watermarking is widely used in ownership protection, traitor tracing, content authentication, and so forth. To keep low cost, a mobile agent is used to partitioning some of the watermarking tasks. To counter transmission errors, some channel encoding methods are proposed to encode the watermark. To keep robust, some means are proposed to embed a watermark into media data of low bit rate. Based on both watermarking and encryption algorithms, some applications arise, such as secure multimedia sharing or secure multimedia distribution. In this chapter, the existing wireless multimedia encryption and watermarking algorithms are summarized according to the functionality and multimedia type; their performances are analyzed and compared; the related applications are presented; and some open issues are proposed. Digital Watermarking: Digital watermarking is the technology to embed information into the original data by modifying parts of the data. The produced data are still usable, from which the information can be detected or extracted. Scalable Encryption: Scalable encryption is the multimedia encryption method that keeps the scalability of the progressive or scalable media data. The scalable media data can be produced by such codecs as JPEG2000, MPEG4, scalable video coding (SVC), and so on. Robust Watermarking: Robust watermarking is the watermarking algorithm that can survive not only such general operations such as compression, adding noise, filtering, A/D or D/A conversion, and so forth, but also such geometric attacks such as rotation, scaling translation, shearing, and so forth. It is often used in ownership protection. Format Compliant Encryption: Format compliant encryption is the multimedia encryption method that keeps the format information unchanged. In this method, the encrypted media data can be decoded or browsed by a general decoder or player. Commutative Watermarking and Encryption: Commutative watermarking and encryption is the watermarking-encryption pair that supports the exchange between the encryption algorithm and the watermarking algorithm. Thus, the media data can either be watermarked followed by encryption or be encrypted followed by watermarking. Joint Fingerprint Embedding and Decryption: Joint fingerprint embedding and decryption is the technology to implement fingerprint embedding and data decryption at the same time. The input is the encrypted media copy, while the output is the decrypted media copy with a unique fingerprint, for example, the customer ID. Partial Encryption: Partial encryption is the encryption method that encrypts only parts of the original data while leaving the other parts unchanged. In this method, traditional ciphers can be used to encrypt the selected parts.